nanjIyar highlights that madhurakavi AzhwAr says nammAzhwAr‘s glories can be experienced with this body (in this life) itself. nampiLLai highlights that madhurakavi AzhwAr sustains himself by reciting nammAzhwAr‘s pAsurams. periyavAchchAn piLLai highlights that madhurakavi AzhwAr revealed nammAzhwAr‘s pAsurams are most relishable for him in the first pAsuram and reveals that he sustains himself with nammAzhwAr‘s pAsurams in this life. AzhwArs assumed bhagavAn as their AchArya. madhurakavi AzhwAr assumes his AchArya (nammAzhwAr) as bhagavAn (supreme lord/master). yasOdhA mAthA tied kaNNan emperumAn to punish him for the mischiefs and continued with her daily routines (just like the ones who would perform their sandhyA vandhanam without fail even during adhyayana uthsavam). krishNa did not try to relieve himself from the binding wanting the one who tied him (his mother) to free him. Similarly, nammAzhwAr was mesmerized by krishNAnubhavam and became totally bound to emperumAn being unable to free himself. But madhurakavi AzhwAr relished krishNAnubhavam which is dear to his AchArya nammAzhwAr but freed himself and focussed on nammAzhwAr‘s qualities, etc. When madhurakavi AzhwAr was asked why he gave up relishing krishNAnubhavam, madhurakavi AzhwAr replies “When some one gets some joy in this world or other world, they still look out for other favours since they have more time to spend. But for me, both in this world and the other world, nammAzhwAr is the only master and goal. So there is no need for me to engage in bhagavath vishayam directly”. I attained great joy by reciting (nammAzhwAr‘s pAsurams) with my tongue. I am truly/eternally surrendered to nammAzhwAr‘s golden feet. I do not know any God other than nammAzhwAr who is filled with auspicious qualities and who is the leader of AzhwArthirunagari. I will roam around (spend my time) singing the sweet music of such AzhwAr’s pAsurams. It is said that “mana: pUrvO vAguththara:” (first thoughts and then words). Even that is not needed – just words without the initiative of mind is sufficient to glorify AzhwAr. As said in “prathyakshE gurava: sthuthyA:” (Glorify the AchArya in public and in his presence) – the purpose of the tongue is to glorify the AchArya who has done great favours. Like thiruvadi (hanumAn) said “bhAvO nAnyathra gachchathi” (I cannot think about any one else other than srI rAma), here madhurakavi AzhwAr says “maRRaRiyEn“. As mentioned by nammAzhwAr in thiruviruththam 53 “dheivaththaNNan thuzhAyth thArAyinum thazhaiyAyinum thaN kombathAyinum kIzh vErAyinum ninRa maNNAyinum koNdu vIsuminE” (Just scatter me emperumAn‘s thuLasi garland, its string alone, the leaves alone, its stem, its root or even the soil on which it was grown – I just need something related to emperumAn“). Similarly, nammAzhwAr says the music of AzhwAr’s pAsuram itself is sufficient for him. I took shelter of nammAzhwAr‘s golden feet. Here the key is to understand that madhurakavi AzhwAr does not consider nammAzhwAr‘s lotus feet as just upAyam (means) to get something else – but as the ultimate goal as well. madhurakavi AzhwAr gives up aiswaryam (material wealth/pleasures), kaivalyam (enjoying one self) and bhagavAn too. Finally he is fully focussed on nammAzhwAr alone. Like nammAzhwAr himself said “kurukUrch chatakOpan” in thiruvAimozhi, here madhurakavi AzhwAr says “kurukUr nambi“. As nammAzhwAr said in thiruvAimozhi 4.5.3 “vIvilinbam miga ellai niganzhnthanan mEvi” (I attained utmost joy by surrendering to emperumAn), here madhurakavi AzhwAr says “inbameythinEn” (attained bliss) – whatever nammAzhwAr experienced in bhagavath vishayam, madhurakavi AzhwAr experiences that in nammAzhwAr. Whatever nammAzhwAr experienced by dedicating his mind, words and action (chinthaiyAlum chollAlum cheykaiyinAlum – thiruvAimozhi 6.5.11), madhurakavi AzhwAr experiences the same just by words (nAvinAl naviRRu). As madhurakavi AzhwAr says “meymmaiyE mEvinEn” (eternally surrendered), ALavandhAr follows in sthOthra rathnam 2 “athra parathra chApi” (in this and the other world). “pAdith thirivan” (spend my time singing) is like “uNdu thirivan” (eating and roaming around). Just like some people spend their time eating and roaming around, madhurakavi AzhwAr spends his time singing nammAzhwAr‘s thiruvAimozhi and preaching the same to others. Why is madhurakavi AzhwAr saying “nAvinAl naviRRu“? Isn’t it obvious that one can recite only with tongue? nAyanAr explains that “It means simply reciting with the tongue without engagement of the mind – that itself is sufficient”. madhurakavi AzhwAr says “eythinEn” (past tense). In bhagavath vishayam, the bliss is attained in the future (after reaching paramapadham). But in AchArya vishayam, bliss is attained right here in this world and right now. ponnadi – golden feet. 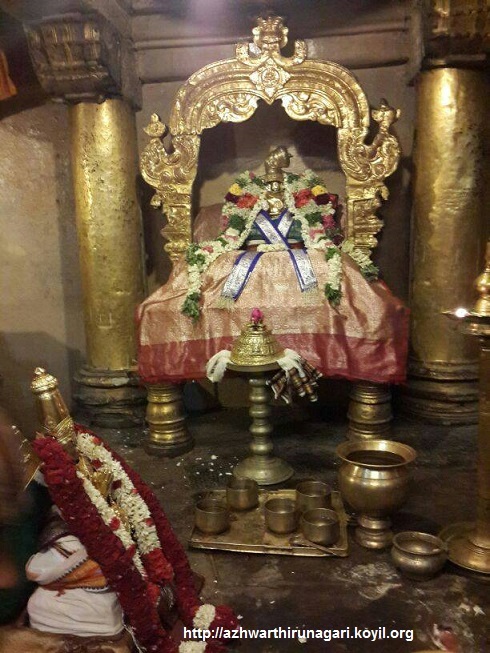 This is not “ulagamaLantha ponnadi” (periya thirumozhi – that which measured the three worlds and touched everyone’s head during the process) but “thraividhya vruththa jana muRththa vibhUshaNa” (parAnkusa ashtakam – the lotus feet that decorate the head of most knowledgable persons). Since its golden feet, it does not become contaminated even by my touch (Gold – purity). dhEvu maRRaRiyEn – madhurakavi AzhwAr is fully following sAsthram, as thaithriya upanishadh says “AchArya dhEvo bhava” (Let the AchArya be God). A question is raised to madhurakavi AzhwAr – “But why did you say bhagavAn as ennappan (my swamy – lord)?”. madhurakavi AzhwAr says “that is because bhagavAn is dear to nammAzhwAr“. This is like sIthA pirAtti helping srI rAma while he was performing thiruvArAdhanam to periya perumAL. sIthA pirAtti did not have any separate inclination towards periya perumAL – her motive was to assist srI rAma only. meymmaiyE – sathyam (truth) only. avan ponnadi meymmaiyE (bowed in front of nammAzhwAr truly) – would anyone lie when srI satakOpam (srI satAri – nammAzhwAr) is on ones head? kurukUr nambi – the leader of AzhwArthirunagari who is complete in auspicious qualities. As said in thiruvAimozhi 3.9.11 “ERkum perumpugazh vAnavar Isan kaNNan thanakku ERkum perum pugazh vaNkurukUrch chatakOpan” (kaNNan emperumAn, the leader of nithyasUris and mukthAthmAs, is the most qualified person to accept glorifications; and nammAzhwAr, the leader of AzhwArthirunagari is the most qualified person to glorify emperumAn). bhagavAn is complete with parathvam (supremacy) and saulabhyam (simplicity). nammAzhwAr is complete with gyAnam (knowledge) and bhakthi (devotion). This entry was posted in kaNNinuN chiRuth thAmbu, mudhalAyiram on January 25, 2015 by Sarathy Thothathri.